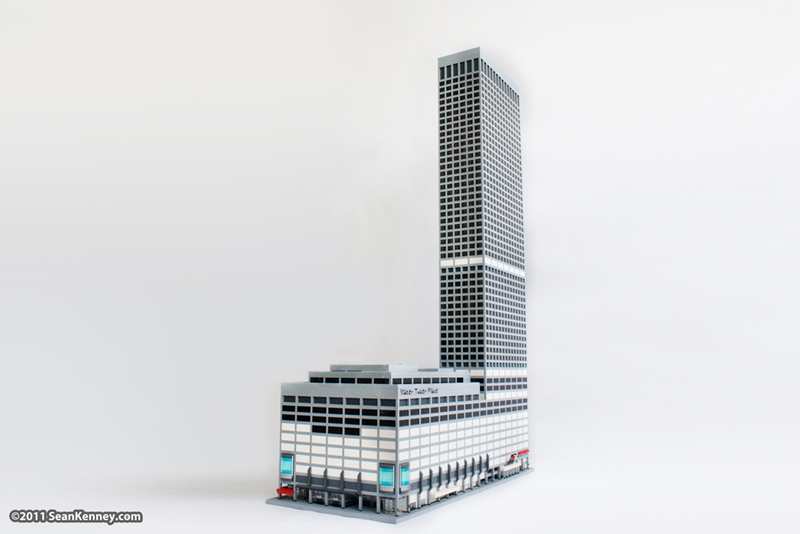 This model of Water Tower Place in Chicago is over 6 feet tall and contains 34,000 LEGO pieces. It is on display inside the real building itself. The building was created together with Trump International Hotel and Tower and the Tribune Building . which are together on permanent display at the LEGO store at Water Tower Place Mall in downtown Chicago. Even though this building is taller than most adults, it doesn't mean I was going to skimp on details. Down at street level, the model has all the details found in the real building... Revolving doors, flags, banners, plants, signs, and more. You can even look straight through the roadway entrance that runs across the building. Because I'm insane, I always have to make my building's windows with window shades behind them, some open, some closed, some halfway in between. It takes a lot longer to build the building this way, but it really adds a lot of life to the model. It's one of those things that you never realize is there, but if it was missing... you'd notice. Much along the same lines, I have this bizarre fascination with "roof junk". You can see this model in person! It's on permanent display at the Chicago LEGO Store. My assistant Geoffrey did a lot of the building on this model! Here he is, posing with his masterpiece.